story by Bernard Brown | photos by Christian Hunold. 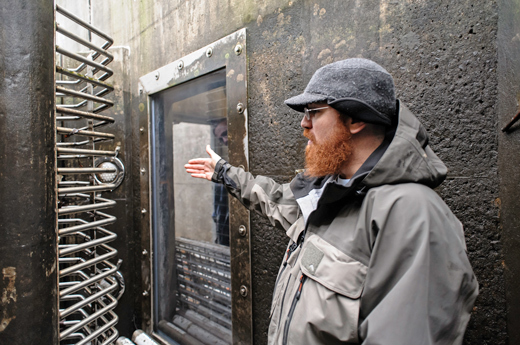 Joe Perillo, a biologist with the Philadelphia Water Department, talks about the fishway and points to the fish crowder - a metal apparatus that forces the shad closer to the window so the Water Department can take a better photo. When we think of migrating fish swimming upstream to spawn, we picture salmon heroically leaping up waterfalls — the stuff of inspirational posters. But the American shad is different. “Shad don’t jump,” Joe Perillo, a Philadelphia Water Department (PWD) biologist, plainly states. American shad stay in the water, and for millennia they swam gracefully up the Schuylkill River as far as Pottsville. Those mighty salmon might have been able to make it over the Fairmount Dam (salmon never actually swam this far south), but not our shad. Blocked from reaching their spawning beds, they’ve pretty much disappeared. Dams up and down the Eastern Seaboard have turned American shad from a commercially and culturally important fish into a historical curiosity; we remember them in Philadelphia at “Fishtown,” even if their April Shadfest has to import the actual fish. But American shad are making their comeback in the Schuylkill thanks to a bit of clever engineering called a fishway. It is a type of “fish ladder,” a series of switchbacks that zigzag back and forth, like shallow steps, transforming the steep climb and surging waters of a dam or waterfall into a gradual rise and a gentler, more shad-friendly current. Located at the Fairmount Dam and elsewhere on the river, these fishways are helping the shad get up and over various obstacles so they can get upriver to spawn. Their babies will make the trip back downstream, grow up in the Atlantic Ocean and, we hope, come back when it’s their time to spawn. The shallow steps of the Fairmount Dam Fishway help shad move upstream so they can find somewhere to spawnThis spring I tagged along with PWD workers on a weekly fishway cleaning trip. They shut a gate at the top of the ladder and water drained from the top compartment into the next one, and then on down through a switchback to the bottom, leveling with the water below the dam. These compartments are arranged as shallow steps. When full, they let fish swim from one to the next, resting a bit at each level. The shad won’t simply come if you build it, though. Perillo explains that a $1.5-million overhaul of the fishway in 2008 made it especially shad-friendly. It now features a pipe that shoots water diagonally across the river channel to get the fish’s attention, and there’s a calm spot right next to the fishway to make it stand out even more. Metal plates at the gaps between compartments calibrate the flow from level to level, and careful design eliminates shadows and bubbles, both of which spook the skittish shad. PWD biologists have also been releasing hatchery-raised baby shad into the Schuylkill for a few years now. The idea is that these shad will remember their childhood home and come back to spawn later, jumpstarting a self-sustaining population. These days about 3,000 are making their way back up to spawn each year. They’ve been spotted as far up river as Phoenixville. Most of these fish are from the hatchery, but a few have been new, unmarked fish, a sign that shad are reestablishing themselves in the Schuylkill.